1965 GT with Standard Interior Mustang Instrument Bezel. This is the instrument bezel that was installed on all 1966 GT350 Carryover cars. The Carryover GT350 Shelbys were ordered with the gauge package that was used on the ’65 GT equipped Mustangs and the Mustangs equipped with Deluxe “Pony” interior. This package included a wiring harness that accommodated the five gauge instrument panel rather than the Falcon style long speedometer found in the rest of the ’65 Mustangs. The Instrument Bezel was a bit unique in that it was only used on this model. It is similar to the one used in all 1966 Mustangs, but with a few different details. 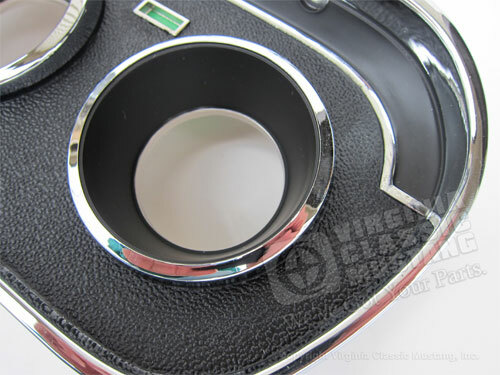 These instrument bezels are available in a very nice reproduction from Virginia Classic Mustang Inc. Click here to order.